History was my favorite subject in school so I have tried to nurture an appreciation for the past in my kids as well. 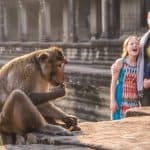 I believe the best way to instill a love of history in my kids is to take them to interesting historical sites where visitors immerse themselves in the past. 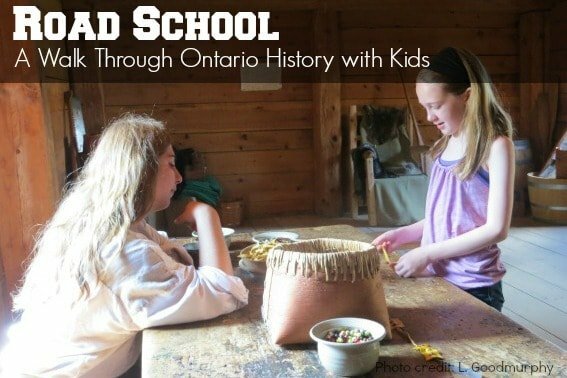 Fortunately, there are a number of attractions across the province of Ontario that are ideal for hands-on Ontario history lessons. 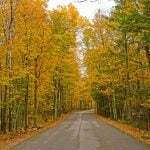 Check out our entire road school series with tips on using travel to promote education! 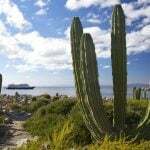 The first Europeans to set foot in the region were French explorers who traveled up the Saint Lawrence River in search of a northwest passage to the East. One of these early explorers was Samuel de Champlain who, beginning in 1613, spent several years exploring westward through New France to the Great Lakes and Georgian Bay regions. Later in the 17th century, French Jesuits followed Champlain’s trail to Wendake, an area on Georgian Bay that was the ancestral homeland of the Huron Wendat nation, a branch of the Iroquoian family. Here the French Jesuits established a mission called the Sainte-Marie-among-the-Hurons mission. 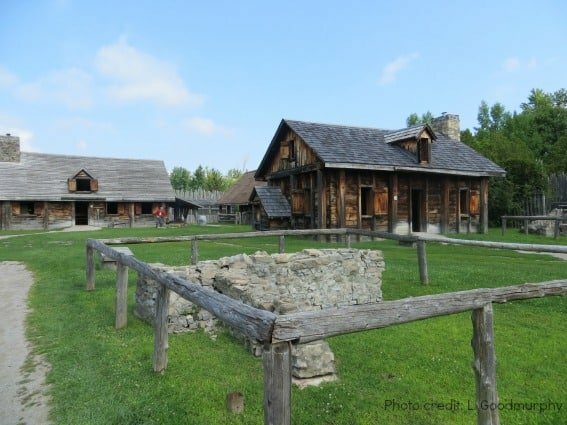 Families can visit the historical reconstruction of the Sainte-Marie-among-the-Hurons mission near Midland, Ontario. This historical site is a great choice for families who want to learn about this period of time in early Canadian history. The original mission that was established by French Jesuits in 1639 was a self-sufficient community. However, in 1649 the mission burned to the ground and was abandoned by the Jesuits because of ongoing attacks by the Iroquois. 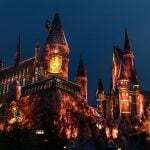 The ruins remained untouched for almost 300 years until work began on the reconstruction. My 11-year-old daughter and I spent several hours at Sainte-Marie-among-the-Hurons this past summer exploring the site, participating in the day’s activities, and talking to costumed interpreters who were demonstrating various skills and answering questions. While walking around the settlement one gets a sense of how hard daily life must have been here 375 years ago. Even on a hot, humid summer day, natives and Europeans were all hard at work at various tasks while fires burned and smoke filled the air making it difficult to breathe. During the summer months, daily demonstrations are held with activities such as cooking, fire starting, 17th century medicine, and First Nation’s games. Interpreters also demonstrate how canoes bearing supplies were brought into the mission via a waterway and a system of locks. 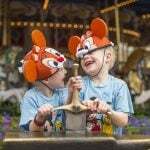 Special activities for kids include quill pen writing, beading, and birch bark basket making. The War of 1812 began when the United States declared war on Great Britain. The war began in June of 1812 and continued for the next 2.5 years. At the time of the war, Canada was a colony of Great Britain and was invaded several times by American troops attempting to annex British land. Since many of the battles were fought along the border between the U.S. and Upper Canada (now Ontario) and Lower Canada (now Québec), there are a number of forts and historical sites relating to the War of 1812 in this area that are open to visitors. In 2012, War of 1812 historical sites on both sides of the border began a joint bicentennial celebration of 200 years of peace between the U.S. and Canada with special events at many of these historical sites. Fort York, originally built in 1793, is considered to be the birthplace of urban Toronto. This fort provided a first line of defense to the growing city of York and is best known as the site of the violent Battle of York which took place here in 1813. Today Fort York is a National Historic Site and is home to Canada’s largest collection of War of 1812 buildings. Events at the fort include demonstrations by the Fort York Guard, historic cooking classes, lantern tours, and more. The entire Fort York site is currently undergoing revitalization including a soon-to-be-open Visitor’s Centre which will have multi-media programming, exhibits, and a Battle of York immersion experience. 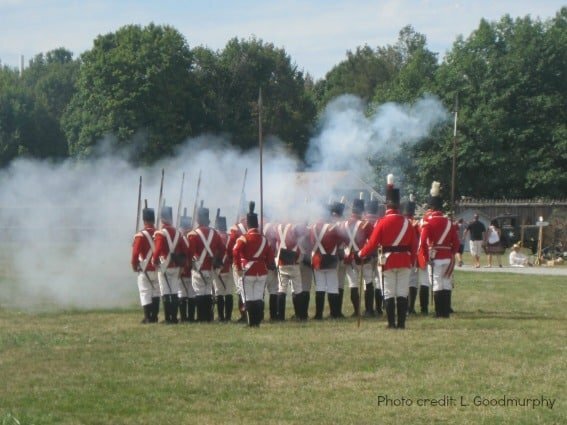 Fort George National Historic Site in Niagara-on-the-Lake was the headquarters for the Centre Division of the British Army during the War of 1812 including British regulars, local militia, aboriginal warriors, and freed slaves. Major General Sir Isaac Brock served here until his death at the Battle of Queenston Heights in the fall of 1812. 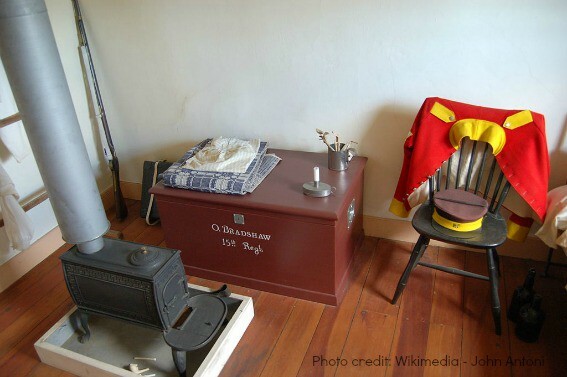 Visitors can take a self-guided tour of the fort and reconstructed buildings, talk to costumed interpreters about life at the fort 200 years ago, and attend musket, military, and artillery demonstrations. Children can pick up a Parks Canada Xplorer activity booklet that will encourage them to experience the fort in a fun, interactive way; they will be rewarded with a certificate for their efforts. Fort George also has a number of programs available including the Hands On History at Fort George program which provides participants with an opportunity to try on uniforms and fire a musket as well as role-play programs, which allow participants to experience a day in the life of a soldier on the Niagara Frontier. 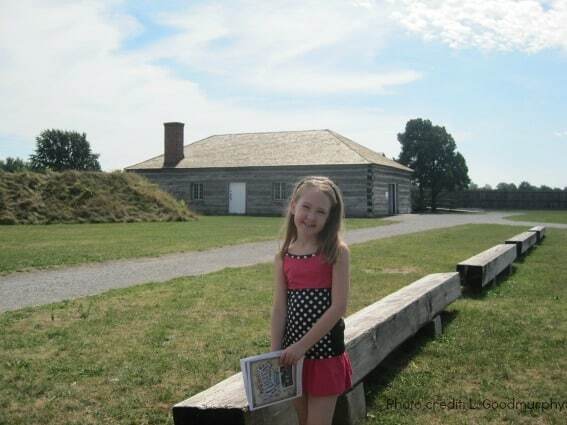 The Fort also runs a popular overnight program for school groups to experience life at the Fort in 1812. 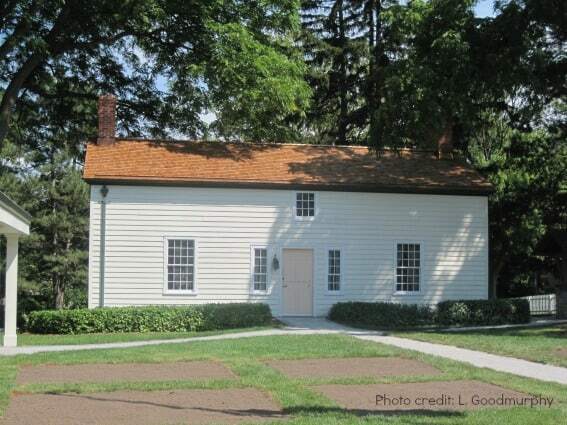 The Laura Secord Homestead, located in the village of Queenston just a few minutes from Niagara Falls, is the restored homestead where Canadian heroine Laura Secord lived from 1803-1835. The site can only be viewed during a 30-minute guided tour led by costumed interpreters. The guide provides general information about life in the Niagara region early in the 19th century as well as details about the actions Laura Secord took during the War of 1812 to warn the British of an impending attack. My daughter was quite interested to learn how one woman’s bravery likely changed the course of a war, but was equally intrigued by the tidbits about daily life during that time period. 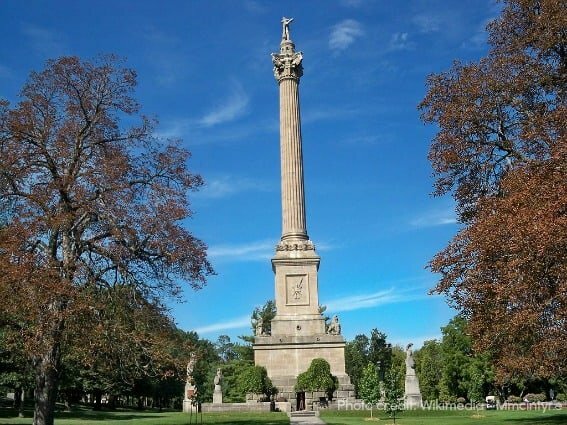 Brock’s Monument is a 185 foot column located in nearby Queenston Heights Park. It is the largest monument of its kind in Canada and honors Major General Isaac Brock, Commander-in-Chief of British forces in Upper Canada, who was killed in the Battle of Queenston Heights in 1812. The site offers a small museum and visitors can climb the 235 steps to the top of the column for a panoramic view of the area. The battlefield can also be toured with costumed guides. Historical reconstructions or living history museums are a great way to step back in time and learn what life was like in another era. 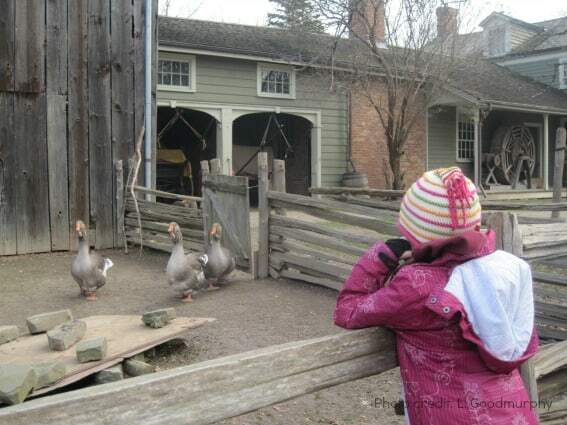 Our favorite living history museum is Black Creek Pioneer Village in north Toronto, where visitors can become immersed in the daily lives of rural villagers during the middle of the 19th century. The village is spread over 30 acres and features heritage buildings furnished with period furniture and artifacts that visitors can tour while historical interpreters in period dress conduct demonstrations and answer questions. The village always has a full slate of kid-friendly activities and demonstrations, educational programs for school groups, and family workshops available. Kids love the Hands on History program where they can try activities such as carding wool, shingling a roof, and building a log cabin. The farm animals are also a big draw for families. Upper Canada Village is a similar historical reconstruction located in Morrisburg, which is about an hour’s drive from downtown Ottawa in Eastern Ontario. Visitors here are transported back in time to a rural English-Canadian community on the St. Lawrence River in the latter half of the 19th century when life moved at a slower pace. There are more than 40 heritage buildings on the site including a bakery, a sawmill, a school house, a hotel, a printing office, a physician’s house, and so much more. Costumed interpreters are on-hand to answer questions and conduct demonstrations of traditional handiwork such as weaving, spinning, or dressmaking. 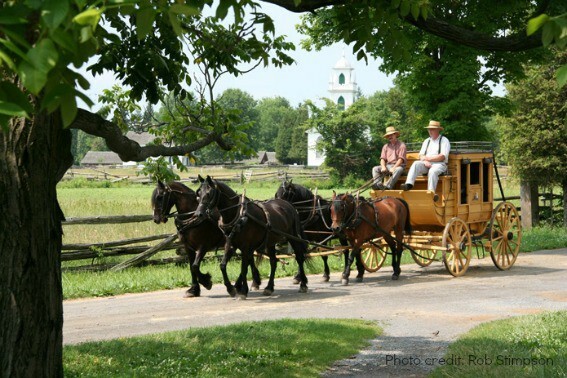 Visitors can participate in hands-on activities, learn about 19th century farming practices, take a horse-drawn wagon ride, or even tour the village in period costume. At the end of a day spent in Upper Canada Village, visitors will have a much better sense of what daily life was like in the 1860s and an appreciation for the modern conveniences we take for granted. Love this post, Lisa. Also, your images are stunning!